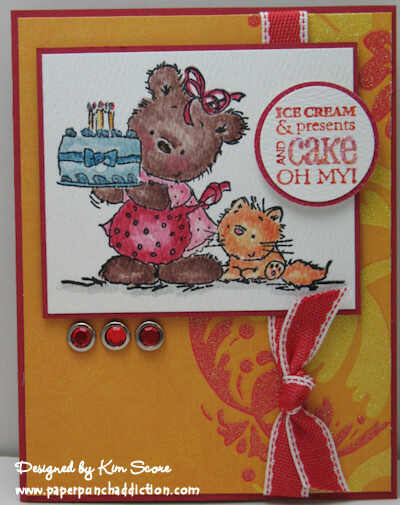 This is the first card I've made for the Mojo Monday challenge blog. They have such great card sketches! I was in the mood to do a little watercoloring. My daughter was invited to her first kid party and this is a special birthday card for her friend. The bear stamp is from Lili of the Valley (these are such sweet stamps!). The greeting is Stampin Up Birthday Bliss. I watercolored with Stampin' Up colors. The designer papers are from the DCWV Citrus stack. I wish you could see this card in person. The papers have glittered swirls and the birthday cake & greeting is all glittery. I used my new favorite ribbon - the Stampin Up! In Colors poly ribbon (poppy).